The ultra-low-cost carrier Spirit Airlines is implementing fees for items that go into overhead bins. (CNN) -- With many airlines now charging a fee for checked luggage, the next step had to come sometime: A carrier asking passengers to pay for the privilege of bringing carry-on bags on board. Well, that time is here. Spirit Airlines announced Tuesday that it will charge its customers $20 to $45 for items they place in the overhead bins. The cost depends on whether passengers are members of the airline's ultra-low fare club and whether they "pre-reserve" their carry-on bag in advance. Each passenger will still be able to bring one personal item that fits under a seat for free, such as a purse, briefcase, backpack or laptop computer. They also won't have to pay extra for items such as diaper bags, pet containers and cameras. Airline officials called it a "bring less; pay less" policy that would ultimately benefit customers. "In addition to lowering fares even further, this will reduce the number of carry-on bags, which will improve inflight safety and efficiency by speeding up the boarding and deplaning process," Chief Operating Officer Ken McKenzie said in a statement. Spirit's new fee is effective for reservations made after April 5 for travel starting August 1. Although it's already among the airlines that charge for checked bags, the ultra-low-cost carrier is the first carrier in the United States to implement a fee for carry-ons. It may also be the first airline in the world to do so, said Genevieve Shaw Brown, senior editor at Travelocity. 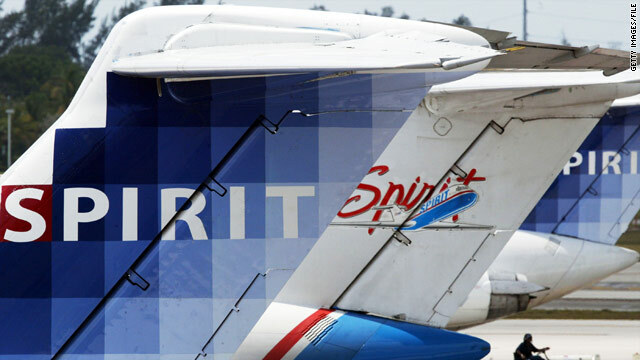 Spirit, which is headquartered in Miramar, Florida, and flies to destinations in the U.S., the Caribbean and Latin America, says it keeps costs low by starting with rock-bottom fares and asking passengers to pay only for the optional services they want. Spirit's new fee structure had industry observers wondering whether other airlines would follow. Shaw Brown called it a "very, very bold move" and predicted that Spirit's competitors would be watching the fee's failure or success very closely. Others wondered whether it signals even more drastic changes for passengers. "When will more shoes drop?" asked Airfarewatchdog.com President George Hobica. "When will we finally see a U.S. airline dare to charge for using a credit or debit card, and who will be the first to eliminate airport check-in counter staff, forcing passengers to show up at the airport with a pre-printed boarding pass and pre-paid luggage fees? ... No human interaction necessary." Another expert said Spirit's move may be too much for fliers who are already enraged by fees. "It's interesting that the program will not kick in until August, perhaps giving Spirit time to cut the program if there's significant backlash from customers," said Jami Counter, senior director of TripAdvisor Flights. "I do think this is a step too far for the traveling public, and other carriers won't follow Spirit's lead on this." The new fee reinforces how important it is for air travelers to stay on top of fees and not be lured by cheap base fares, Shaw Brown warned. "Travelers are going to naturally gravitate toward the airline with the lowest fare, and they may not realize what those extra charges are going to be and how they can add up very quickly," she said. "The best advice is, know all the fees, know the kind of traveler you are, how much you do end up packing and how much it's going to cost you, and make sure to add that to the base fare so that you know exactly how much you're going to be paying." Most major air carriers started adding checked-bag fees in 2008. The airlines reported collecting nearly $740 million in baggage fees in the third quarter of 2009, according to U.S. Bureau of Transportation Statistics. Many have also cut costs by eliminating complimentary meals in economy class and have drawn ire for asking passengers to pay for services like reserving a seat in the emergency exit row, which usually has more legroom. Still, the fees -- even the latest one from Spirit Airlines -- probably won't stop anyone from flying. "The truth of the matter is, the desire to travel often overcomes these annoyances that people face. People adapt," Shaw Brown said.